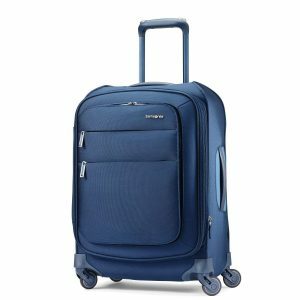 Samsonite Flexis is a 20-inch size expandable, versatile and sophisticated soft side cabin suitcase with spinner wheels and a unique modern design. It is rated 4.6 out of 5 stars by 11 customers at the moment of this review. You can purchase it in carbon blue (1165), cordovan (2156) or jet black (1465) colors at the same price. There is an integrated USB port with two female ends that you can see in the photo to help you charge or power up your tablet, smartphone or USB accessory when you’re traveling. The innovative design quick outer change pocket at the front of the cabin bag gives you a deep front compartment and a good deal of versatility, letting you have easy access to your shoes, coat, tech gadgets or other items. Samsonite Flexis has a special “bend-but-don’t-break” parabolic frame that makes the frame bounce back from the bumps. It is made from recycled pop bottles, hence it is solid, durable and easy to clean. You really can’t go wrong with the Samsonite brand bags, whichever you choose. It weighs 6.61 pounds and measures 22 x 15 x 9 inches including the wheels (21 x 15 x 8 inches inside), making it good for most airlines hand luggage restrictions. The dual adjust handle design is also special as you’ll find the ergonomic push buttons on both sides of the telescoping handle. And you can adjust it for height by pressing the left or right button to any height you need or want. The Flexis comes with the new design low- profile YKK that is claimed to be resistant to wear and tear about 15 times more than the regular coil zippers. These are longer zippers that are easier to hold and definitely not cheap looking or feeling. You can see the latest design Radii spinner wheels at the bottom that are different to anything we have seen so far. And they roll very smoothly on any type of ground, rotate pretty much instantly and reduce the drag. Then you have the smart fix buckle that stays out of your way with the clips holding them on the sides when you’re putting your stuff in and then you can buckle it up easily. Please note that you will still need a charger and cable as they’re not provided in this bag. 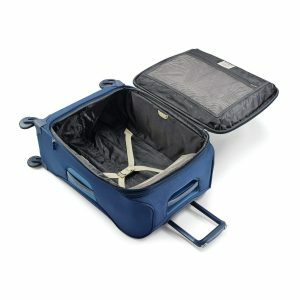 Other Samsonite Flexis models include the 19” spinner, 21” spinner, 25” spinner, 30” spinner, travel duffel, garment sleeve and undersea carry-on. Please check out the product page for their measurements. Other Samsonite products include the backpacks, casual bags, electronics carriers, laptop bags and travel accessories. They have been in business for well over a hundred years and are known for their sturdy, durable, functional and innovative products. Like with other Samsonite bags and suitcases, the Flexis is offered with ten years of limited warranty by the company. It is a great cabin bag overall, with a sturdy build, premium look and feel and user-friendly features.